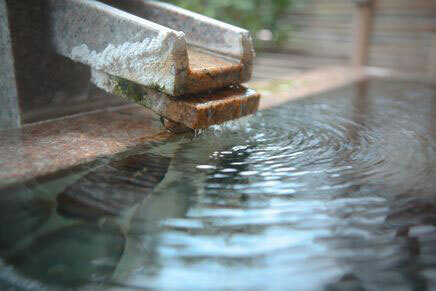 Since ancient times, Tamatsukuri Onsen has been loved by many and regarded as a divine hot spring. 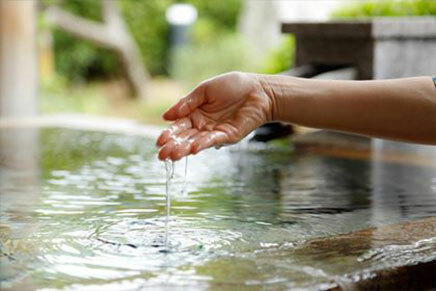 According to the Izumo-no-kuni-no-fudoki, written 1300 years ago, if you bathe in this hot spring once, the skin will become beautiful, and illnesses cured the second time. The spring water contains sulfate, which enhances the skin's absorption of moisture and chloride, which creates a salt veil that then seals the absorbed moisture into the skin. Both effects combine to refine and beautify skin. Also, due to the miraculous balance of ingredients in the hot spring water, it can be used directly as a lotion - such hot springs are rare and this is the only one in Japan. Known as "natural lotion", its skin-beautifying properties are highly sought-after. In recent years, it has even received the highest award at the 2016 " Hot Spring Vote". 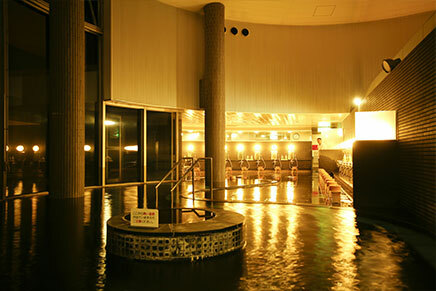 Additionally, pharmaceutical companies have also recognized it as Japan's best hot spring for skincare. 100% piped in from the source. Free of charge. There are 2 locations beside the gently flowing Tamagawa River, and one in Himekami Square. Towels are also sold at the roofed footbath in Himekami Square. Since the acupressure points that promote blood circulation are concentrated in the foot, you should be able to feel the effects of the hot spring after just a short time, so please stop by and try it out. This is a spot where water from the Tamatsukuri Onsen flows out and can be scooped up freely. 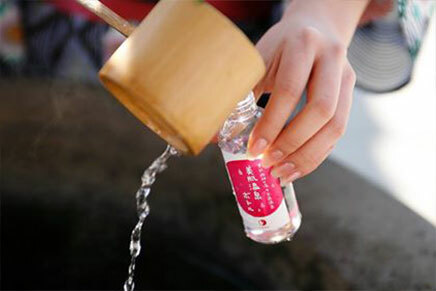 You can bottle the water using one of the hot spring bottles (200 yen) sold at the shrine shop and use it as a 100% natural lotion. Please use it up within a week of bottling. It is also popular as a small souvenir. A day-trip bathing facility where you can easily enjoy hot springs. There is a large magatama-shaped bath tub, an open-air bath, a hot spring with cascading water and a sauna, allowing you to enjoy the charm of Tamatsukuri Onsen to your heart's content. There is also a rest and massage space, and a fully-stocked souvenir corner. Shimane's traditional performing art, "Yasugi-bushi" will be held here every night, which can be viewed for 500 yen. Enshrined here are the ancestral deity of Tamatsukuri, Kushiakarutama-no-Mikoto, deity of nation building and hot spring healing Onamochi-no-Mikoto and patron deity of hot springs Sukunahikona-no-Mikoto. Some of the precincts of the shrine are part of the nationally-designated Izumo Tamatsukuri Historic Site, and jade-crafting was actively practiced in the area near the shrine since the end of the Yayoi period. In recent years, people from all over Japan have come to pray for "Negai-ishi" and "Kanai-ishi", stones that fulfill wishes. It is one of the Three Sacred Treasures of the imperial family. Believed to have mystical power, it has been worn as a talisman since ancient times. Its effects differ according to the kind of stone used to create it, and a magatama chosen intuitively is said to bring you exactly the kind of power that you need. 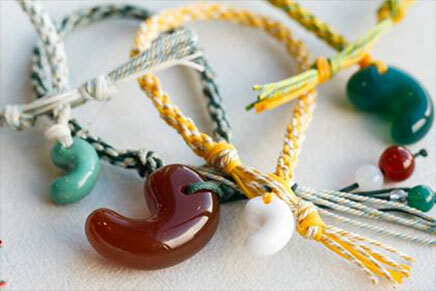 In ancient times, Tamatsukuri was one of the few magatama production centers in Japan. It is a temple of the Rinzai Myoshin-Ji School founded in 1637. 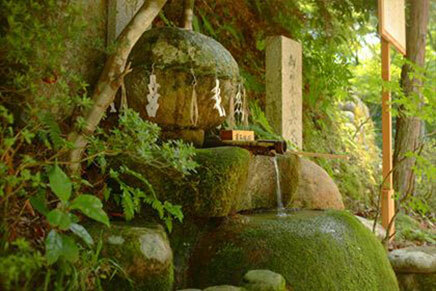 The principal deity enshrined is Amida Nyorai (Amitabha Tathagata), hence it is also known as Onsen-zan. By using the unusual method of applying face powder on the Oshiroi Jizo enshrined within the temple, you can pray for beautiful skin and healing of illnesses.